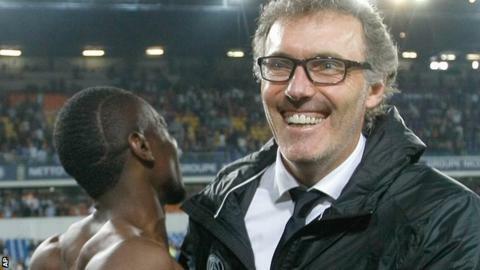 Paris St-Germain manager Laurent Blanc believes there is still room for improvement from his side after they clinched a third straight French title. PSG won 2-1 at Montpellier on Saturday to become Ligue 1 champions ahead of Lyon with one match to spare. They could become the first club to win the French domestic treble when they play in the French Cup final on 30 May. "We will try to do better next season, see where we can make improvements and to go further next year," said Blanc. Blanc's side made a slow start to their title defence, drawing six of their opening nine matches as Marseille were the early leaders. Lyon took charge in the new year, before PSG moved top on 20 March at the start of an eight-match winning streak which led them to the title. The Parisians also lifted the Coupe de la Ligue with a 4-0 win against Bastia last month and face second-tier Auxerre in the Coupe de France final on 30 May. However, they were eliminated at the quarter-final stage of the Champions League following a 5-1 aggregate defeat by Barcelona. "A title always tastes good, but the manner in which one wins it can bring an extra satisfaction," added ex-France international defender Blanc. "We were up against it in the first part of the season for various reasons. "We pulled ourselves together and I maintained above all my faith in the players and that was a good call because they repaid this confidence." Now the Qatari-owned capital club is targeting Lyon's record of seven consecutive Ligue 1 titles between 2002 and 2008. "Paris do not want to stop now, we want to continue to make progress and to get better," said Blanc. "I hope that will happen."